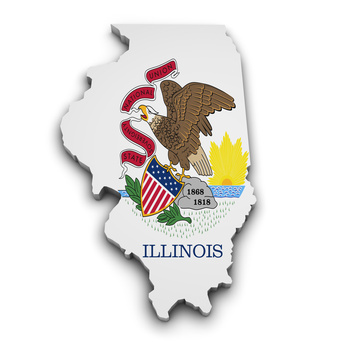 Filing bankruptcy in Illinois is largely the same as every other state. In case you are unfamiliar with Federal bankruptcy laws, below is a quick overview of what to expect in Illinois, and what makes filing for bankruptcy unique in Illinois. In order to file for chapter 7 bankruptcy in Illinois your household income level must be below the median state income level. As of 2013 (the most recent year with data), the median household income in Illinois is $54,044. If you fall below this threshold than you may be eligible to file for Chapter 7 bankruptcy in Illinois. If you have an income greater than the median income than you must pass a means test to determine eligibility. 60 months is the longest repayment term in Illinois and may be shorter depending on your average income. If your average income over the previous six months is greater than the median household income in Illinois then you will usually be required to adhere to a 60 month plan. However, if your income is less than the median household level in Illinois than you can request a 36 month plan even if that means you might not repay all of your debts. It is possible to protect property in bankruptcy so that the debtor does not have to start from scratch after finalizing their bankruptcy. Illinois bankruptcy laws outline a number of exemptions which allow individuals to protect their assets. In an Illinois Chapter 7 bankruptcy, exemptions allow a debtor to keep certain property. In a Chapter 13 bankruptcy, the non-exemption amounts are used to determine how much the debtor will pay to unsecured debtors, such as credit card companies. This amount in a Chapter 13 is usually incredibly small. Illinois is one of the many states that have chosen to opt out of the federal bankruptcy exemptions. Debtors in Illinois have to use the state bankruptcy exemptions only, and the personal property exemptions in Illinois can be found at 735 ILCS 5/12-1001. Married couples who opt to file for bankruptcy jointly can get double exemptions on property that they own jointly. This means that each spouse can claim the full dollar amount of an exemption for property that they own and the bankruptcy trustee or any creditors can?t touch it. Illinois bankruptcy exemptions allow individual debtors to keep money from alimony, maintenance, spousal support and child support if it is necessary for them to support themselves. Fraternal society benefits are fully exempt, and so are retirement benefits and pensions. Illinois has a homestead exemption (found at 735 ILCS 5/12-901) that allows the individual to protect some of the equity in their home. Debtors can exempt a maximum value of $15,000 of equity in their residence, including a condominium, cooperative, an empty lot or even a farm. The debtor can also exempt this amount from the sale of their home. License interests, permits and franchise interests are also exempt in an Illinois bankruptcy. Future care funds and sales from cemeteries plots are exempt. A debtor can also exempt 100% of all victims compensation that they receive for being the victim of a crime. They can get this exemption up to two years after they got the right to receive this compensation. Any property that was purchased with this compensation will be exempt for five years from the date when the debtor received the compensation. A debtor can exempt forty-five times of their minimum hourly wages or eighty-five per cent of their gross income, whichever is greater (see 735 ILCS 5/12-803). The debtor can also exempt workers? compensation and awards or claims for any occupational illness. Veterans? benefits, unemployment compensation and public assistance are fully exempt. Tools of trade are exempt up to a maximum of $1,500. These trade tools include professional books, equipment and trade implements. Debtors can also exempt some of their personal property. Clothing is 100% exempt, and so are school books and family pictures. If the debtor has a certificate of title for any watercraft that is more than twelve feet long, this property is exempt. The debtor can also exempt prescribed health aids and personal property that is worth up to $4,000. The Uniform Partnership Act exempts partnership property in order to protect a business partner?s interests. A debtor can exempt up to $2,400 in a single motor vehicle. In case a debtor is the beneficiary of life insurance benefits, the beneficiary?s amount is 100% exempt. Other benefits that are 100% exempt include annuities and endowment policies that a spouse or a dependent receives. In the case a debtor receives money for wrongful death of their dependent, they may exempt the entire amount of settlement or jury verdict. They can also exempt compensation for personal injury to themselves or their dependents up to $15,000. The Illinois bankruptcy exemptions are updated from time to time. An Illinois bankruptcy lawyer will help the debtor understand the complexities of the ever-changing exemptions. This will make it possible for them to keep their property when they file for bankruptcy. There are also a lot of other properties that may be exempted when filing for bankruptcy. One important thing that anyone considering bankruptcy should do is to contact their bankruptcy lawyer with a copy of their credit report. The lawyer will then evaluate their credit report and advise them how they can take advantage of the Illinois bankruptcy exemptions and keep their properties. In a Chapter 7 bankruptcy, a person?s non-exempt property is sold and the proceeds are used to repay unsecured creditors in order of priority. After the debts are paid, the court will discharge all unsecured debts and no creditor is supposed to ask the debtor for any more payments. In a Chapter 13 bankruptcy, the non-exempt property amount is used to determine the amount of money that the debtor will have to repay to unsecured creditors. During a Chapter 7 bankruptcy, if the exempt amount is less than the value of the property, the property will be sold and the exempt amount will be refunded to the debtor. Bankruptcy is not meant to completely cripple the debtor. It is supposed to give them a fresh start. This exemption amount will make it possible for the debtor to bounce back after filing for bankruptcy. Most people contemplating filing bankruptcy in New York fail to get a copy of their credit score prior to their attorney consultation. ?It will be helpful if a bankruptcy attorney reviews your credit score so they can evaluate what debts are hurting you, and who the holder of the debts currently are (the original holder of the debt or a new collection company). Under federal law, each credit rating agency must give you one free credit report per year ? obtain yours here. ? Bankruptcy was created for those who need to get the weight of debt off their backs. ?Get started today ? contact a bankruptcy attorney for a 100% free consultation.